Are you ready to #hurl the habit? 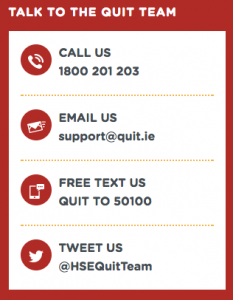 FREE services available in Waterford to help you quit smoking for good! You may be thinking about quitting and you may have tried before- in fact most smokers make a few attempts before they QUIT for good. You may even be a little worried that even though you want to, you can’t do it. Well, you CAN QUIT, and you don’t have to try alone. Kate Cassidy is a Health Promotion Officer with the HSE in Waterford. As part of her role, Kate provides a range of Smoking Cessation Support Services. Did you know there are twice as many quitters than smokers in Ireland? Remember you are twice as likely to quit with some help so don’t do it alone!